Wendy Lamb Books, 9780385734912, 320pp. 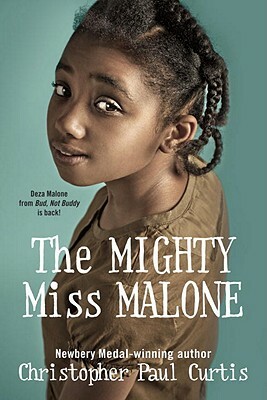 In the Newbery Medal and Coretta Scott King Award–winning Bud, Not Buddy, Bud met a girl named Deza Malone in a Hooverville. This is her story. “We are a family on a journey to a place called wonderful" is the motto of Deza Malone's family. Deza is the smartest girl in her class in Gary, Indiana, singled out by teachers for a special path in life. But the Great Depression has hit Gary hard, and there are no jobs for black men. When her beloved father leaves to find work, Deza, Mother, and her older brother Jimmie go in search of him, and end up in a Hooverville outside Flint, Michigan. Jimmie's beautiful voice inspires him to leave the camp to be a performer, while Deza and Mother find a new home, and cling to the hope that they will find Father. The twists and turns of their story reveal the devastation of the Depression and prove that Deza truly is the Mighty Miss Malone. CHRISTOPHER PAUL CURTIS is the bestselling author of Bud, Not Buddy, winner of the Newbery Medal and the Coretta Scott King Medal, among many other honors. His first novel, The Watsons Go to Birmingham—1963, was also singled out for many awards, among them a Newbery Honor and a Coretta Scott King Honor.